Windows 10 upgrade installations aren't for the helpless. As a longtime Windows reviewer -- and even though I defected to the Mac some time ago -- I don't qualify as helpless. Still, it's surprising that, for a version of Windows on which Microsoft placed so much emphasis on upgrades, Windows 10 has a remarkable set of post-upgrade problems. I can't speak to the number of people dealing with severe issues, but the Internet is filled with posts from users running into slow boot-up times and/or slow operation of Windows 10 after upgrading from Windows 8.1 or Windows 7. It happened to me with a Win8.1 upgrade on my kid's 20-month-old HP Envy quad-core 17-inch gaming laptop. Boot times tripled and Windows ran at a snail's pace (which my son describes as "lagging"). In investigating these symptoms, I discovered they were caused by multiple problems. I'll come back to that point shortly. I also paid for a Windows 10 Home full license and installed the 64-bit version onto a VirtualBox virtual machine running on a MacBook Pro 15 Retina. That setup process went smoothly, and the result is a very fast, trouble-free installation of Windows. I have no complaints there. I didn't beta-test Windows 10, so my experiences with the new operating system are based on four weeks of testing since it shipped. I'm glad Microsoft finally made a version of Windows that can sense whether it's installed on a tablet or a laptop/desktop PC. To me, that's the No. 1 improvement in Windows 10; Microsoft should not have shipped Windows 8 without that ability. Windows 10's prettified Windows 7 interface doesn't wow me. There seems to be no real advantage to the tiles on the Start menu. Most of the rest of the changes on Start are meaningless and just hide functions from the user. For example, even though Control Panel still exists, it's buried. There's a new Start menu item called Settings that's an overview of Control Panel, which becomes a guessing game, or perhaps more appropriately, a shell game. I'm not a big fan of having to resort to typing in menu and applet names that I'm looking for, yet I find myself doing that much more frequently in Windows 10 than any other version of Microsoft's OS -- so much so that I found the Web results mixed in with local results an annoyance. You have to be an advanced user to be frustrated by that kind of experience. I would have preferred a mildly upgraded Windows 7 Start menu, and therefore I'll probably wind up getting Stardock's Start10. Perhaps my biggest criticism of Windows 10, however, is directed at the Edge browser, which I detest. Among other drawbacks, it's the only aspect of Windows 10 that I found to be unreliable. It literally froze up or crashed multiple times. I think it was when I couldn't locate the browser history facility that I finally gave up on it entirely. (You'll find Edge's History under the Hub. Not very intuitive.) Happily, Internet Explorer is still available in Windows 10, although I have adopted Firefox as my default browser. In the end, most of the user interface changes in Windows 10 don't matter much. It will promptly erase the Windows 8 nightmare from memory. Think of Windows 10 as Windows 7.5, and you'll be happy with it. I expect it to be a winner for Microsoft. It won't surprise most experienced users that, with this latest release of Windows, the HP Envy developed a serious case of driver envy. My first thought was to get the Windows 10 driver for Intel's Rapid Storage Technology (RST). This HP model has a hybrid hard drive consisting of a 930GB spinning hard disk and a 22GB SSD, which is primarily used for boot caching. My upgrade from Windows 8 to Windows 8.1 taught me that, without that boot cache, the Envy was pitifully slow at startup, and that the Intel driver was vulnerable to upgrades. On July 30, I checked the HP support site and found a July 27 update for the RST driver. I installed it, restarted the machine a few times and won back about 70% of the boot performance Windows 8.1 had delivered. But HP didn't have many other newer drivers to offer. I wanted to upgrade the video driver, but the Nvidia Experience program was declining to connect to its website for updates. I eventually updated this driver with a manual download from the Nvidia driver download site; HP didn't have it and Microsoft wasn't offering it via Windows update. Since I couldn't be sure the Intel integrated HD 4600 graphics driver on the HP site was for Windows 10, I decided to leave well enough alone for a few days. A week or so later, my son was complaining that the Envy was slow again. I discovered that Intel's Rapid Storage Technology was throwing off errors and had partially self-disabled. So it was back up to the HP support site to see whether Win10 drivers had magically appeared. There was an apparently newer driver for the RST, so I downloaded that. And there were other new drivers for the chipset, the Intel integrated graphics, audio, networking and so on -- I downloaded chipset, video and audio drivers, as well. I was able to make the last three work. Unfortunately, the RST download failed to install and offered only a cryptic error message. My next step was to try to get tech support help. I began digging into the HP support website. When I got to the page that represents support for my specific HP Envy model, it offered two conflicting bits of information: 1. I still have four months of warranty support left on this PC. 2. Hewlett-Packard no longer supports this model. How can that be? Apparently HP believes it has the right to discontinue support whenever the heck it pleases. And because it has discontinued support, it didn't offer me a way to contact support. That only left me one alternative. I dialed HP's main support number and navigated the voicemail menu until I got to something approximating what I was looking for: Laptop support. The person who answered had such a thick accent that I had to ask her four times to repeat the same phrase before I finally understood it. She wanted to know how old my computer was. The BIOS lists the "born on" date as 12/21/2013. I gave her that date and told her I still had four months on my warranty. She asked if I could hold for a couple minutes. That was the last I heard of her. I wasn't even on hold; I'd been disconnected. I gave up on HP tech support. The terrible tech support story is one you could hear from customers of just about any PC maker. What I find more aggravating is that HP had many months of access to public betas of Windows 10. Its existing customers should be the top priority if the company wants to have future customers. HP also released a bunch of drivers on Aug. 7, but apparently most of those were not specific to Windows 10. HP's driver versions -- I found out later -- were not even up to date in all cases. This is the Microsoft ecosystem's biggest problem. What's in it for HP to keep its drivers updated? It's a flawed system. Intel offers drivers for its products on its website. This is always a last resort for me because you never know how much the OEM PC maker may have customized the hardware, software or both in a way that affects the driver's configuration. Intel warns of this on its download page, too. I was able to quickly find an RST 64-bit Windows 10 driver on the Intel site. The version number was in the 14.X range, whereas HP's version number was in the 9.X range. (Could this be why it didn't install? Just saying.) Installation of this direct-from-Intel driver went off without a hitch. Upon reboot, the RST still wasn't enabled. I knew why that was, though. Using the previous driver, there'd been an error message in the RST's configuration screens. I had noticed a setting that allowed you to disable the error message. When I did that and restarted the Envy, I saw a performance improvement, and the error message did not come back. But while boot performance was better, it still wasn't best. The configuration screen's performance tab put the performance level at "Enhanced," which sounded more like a 6 than Nigel Tufnel's 11. Although it was not obvious how to do it (mostly because the RST's Help document didn't match what I was seeing on screen), it was clear there was a way to raise the bar on performance. Once I figured out what to click, the performance status read "Maximized"-- and the job was done. Open Settings > type "performance" in the search field > select "Adjust the appearance and performance of Windows" > click the Advanced tab > and under the Virtual Memory heading, press the Change button. 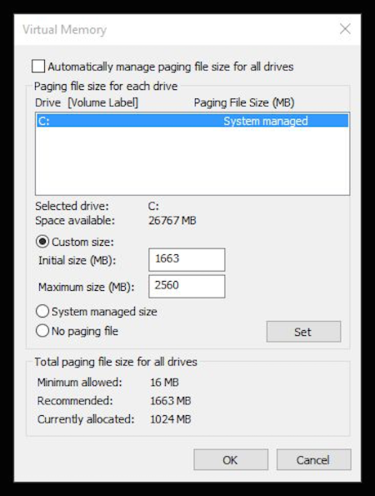 Uncheck the box beside "Automatically manage paging file sizes for all drives." Click the radio button for "Custom size." Put the recommended value into the "Initial size" field. Put a somewhat higher number in the "Maximum size" field. Click the Set button, press OK and restart your computer for the changes to take effect. If you ever want to reverse this setting, just recheck the box for "Automatically manage paging file sizes for all drives." My clean-installed virtual-machine instance of Windows 10 has been completely problem-free. The only issues I've had were minor and directly attributable to VirtualBox not fully supporting Windows 10 yet. After a lot of finessing and rebooting, the HP Envy's Windows installation is finally running well, too. I'm still waiting for my son to tell me that it's no longer "lagging." But I expect that will come as he begins to trust it again.